When you walk up to your home, it can either be mundane and uninspiring, or, it can evoke a dazzling, peaceful feeling as you observe your beautiful garden, plants, shrubs, and fencing. It takes some effort to boost curb appeal, but we’ve broken it down into a few simple tips. The following outdoor décor ideas will transform the surroundings of your home, so you and your visitors can be amazed and inspired by the warmth and welcoming atmosphere of your home. A small fountain, pond, or bird bath provides an instant focal point to your front yard. The sound of the trickling or flowing water makes your home a peaceful place to pass by, as the sounds of birds and chattering squirrels surround the area. Water features are a great addition to gardens and rock formations, as well, so you can incorporate it into preexisting décor with ease. White picket fences and wood fence designs have a rustic and traditional charm that have endured through changing trends. The classic look is perfect for detailing your property and highlighting your exterior décor, and home. Instead of letting your exterior décor disappear at night, add lighting to your front yard to brighten up the beautiful designs when the sun goes down. Accent lighting will direct eyes to the things you want to emphasize and adds security to your home by illuminating driveways and walkways. This beautiful wooden structure is a great way to line walkways, as the beams provide some shelter and add a secure feeling to the surroundings. If you have vines around your home, this structure is a great place for the plants to curl around, and as the flowers bloom, it will feel like walking into an enchanting garden paradise. Do you want your home to evoke romance and elegance? Installing an arbour can achieve this. It is a beautiful, unique, and welcoming structure that helps you achieve a rustic look. You can also spruce it up with steel arches, comfy seats, and blooming climbers for a more dazzling aesthetic. Trellis or lattice privacy screens allow for more privacy around your home, while still allowing natural light to filter in. 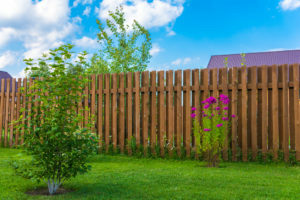 They work well to cover exposed areas surrounding your home and are a more affordable option to building a sturdy fence. They can be used for multiple purposes, including a flower fence, gated arbour, or a patio screen. Are you located in Ontario and looking for a reliable company to help you boost the curb appeal of your house? Are you unsure of the options available within your budget, but still want to transform the look of your exterior décor? Total Fence Inc. is a fully licensed company located in Toronto, and we provide a myriad of beautiful options for our customers. Best of all, we do all the work from start to finish. Want to know more? Feel free to contact us with any questions.